Wow! 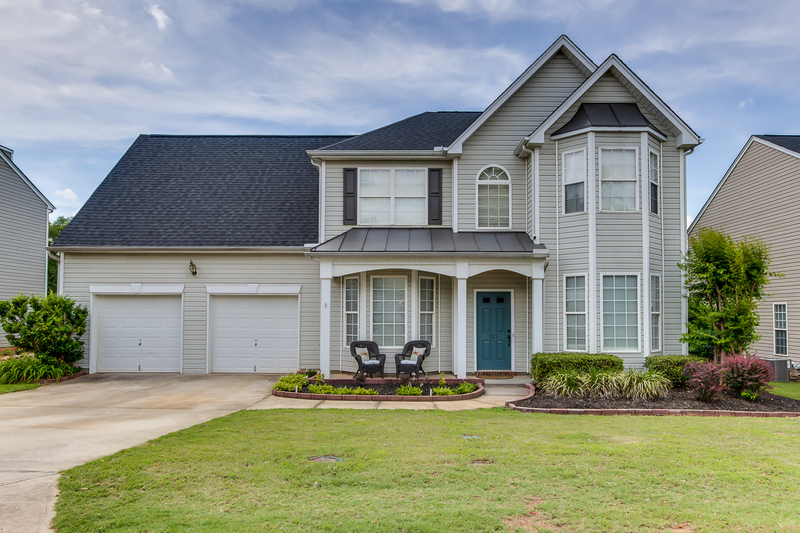 Outstanding Traditional home nestled in the highly sought-after community of LINKSIDE AT BONNIE BRAE off Ashmore Bridge Road in Greenville! 4 Bedrooms/2.5 Baths, trey and vaulted ceilings, bay windows, 2-car garage with work bench, curvy picket fence, dual HVACs and a separate Laundry Room. 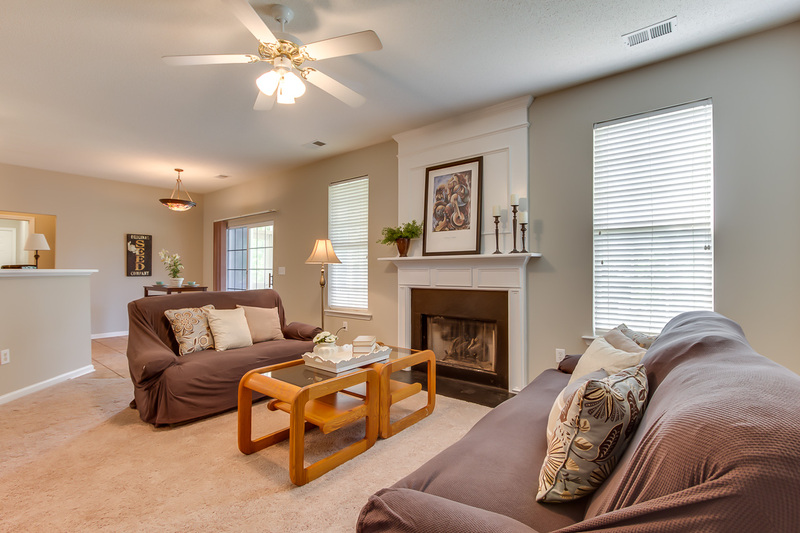 New features include: carpet, hardwoods in foyer and dining room, fresh Sherwin Williams designer paint colors, some new fixtures, lighting, and newer roof. You’ll love the warm, genuine easy-clean stone tile, and picture-frame and crown molding throughout. Off the foyer are the Dining Room and Sitting Area/Office. The pristine all-white Kitchen has new hardware, a separate pantry closet, breakfast bar, and darling eat-in breakfast room. The open floor plan allows for family get togethers and the gas log fireplace in the Living Room makes for cozy winter moments. Across from the fireplace is a custom TV niche with built-in shelving. Private spaces are all tucked upstairs. French doors in the Master Bedroom open up to the trey-ceiling sleeping area and sitting area. Walk a bit further into the En Suite Bath with garden tub/stand-in shower, His and Hers sinks, separate toilet room, and ample walk-in closet. A surprise space off the Master Bedroom closet is a storage/Walk-In Attic with tons of future potential. 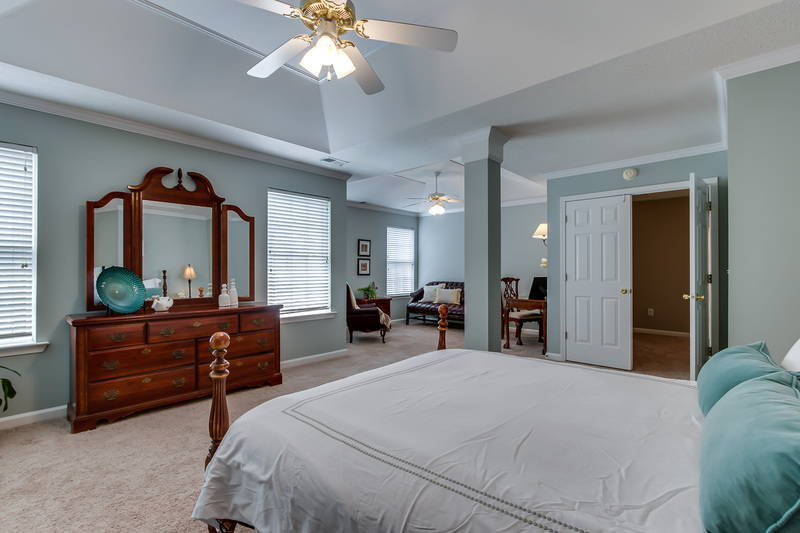 Secondary Bedrooms have sweeping ceiling fans and sizable closets. Off of the upstairs hallway is a linen closet and a spacious bathroom. 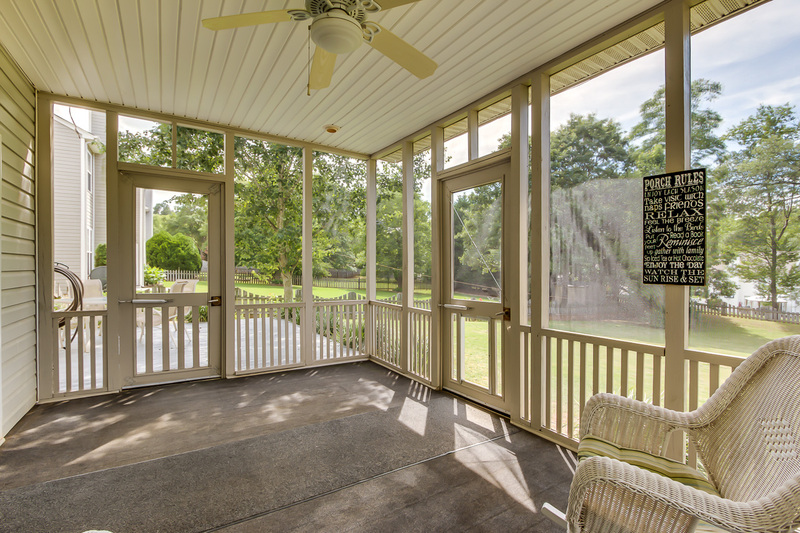 The screened in porch, and side deck overlook the well-manicured yard and provides a place to enjoy coffee in the morning or unwind and star-gaze in the evenings. Incredibly quaint, quiet, and pet-friendly neighborhood that also features a community swimming pool, tot lot, and nearby golf course. HOME WARRANTY included! The home you’ve been waiting for has finally been listed. Come meet your new home – it will not last long! The things we love about Greenville are Falls Parks and the Downtown area. There are many shops, restaurants, and festivals on the weekends in the summer. The Bonnie Brae neighborhood is quiet and far enough away from the city that it seems like you’re in the country; but in 15 minutes, you can be downtown. We love to eat at Smoke on the Water on Friday nights which has great specials during happy hour and the atmosphere is relaxing & fun. Right behind Smoke on the Water is Falls Park which is the most visited park in the Greenville area. Grocery stores are plentiful in the our area. We generally go to the BiLo or Publix which are only 5 minutes away. The area offers an array of options at Whole Foods, Trader Joe’s, Costco, Sam’s Club, Fresh Market, and 2 Walmart Super Stores are nearby as well. When we bought the property we were drawn to the country setting, the golf course just down the road, the Elementary school 2 minutes away, and the large pool in the community. The Greenville area is wonderful because everything is no more than 15 minutes away and you can be in the mountains, at the beach, or in Atlanta/Charlotte in a short drive. A few other things that we love about our location are the private schools that are very reasonably priced and 2 of the top private schools are only 10 minutes away: Christ Church Episcopal School & St. Joseph’s Catholic School. Also, Southside Christian School is only 15 minutes away, all of te these schools have excellent academics and sports programs. We believe the best thing about the Greenville area is that the people are very friendly and easy to talk to and are always willing to help. Of course, we all like different things; that’s why Greenville is a great place to live. There are so many things to do. If you like to golf, it’s huge in Greenville. Biking & hiking are also big in Greenville. They have the Swamp Rabbit Trail that is a big part of the community and Greenville also has 2 minor league sport teams for baseball & hockey: the Greenville Drive (which is an affiliate of the Boston Red Sox) and the Greenville Swamp Rabbits Hockey Team (an affiliate of the New York Rangers and Philadelphia Flyers). The utility costs are nothing compared to what we paid in another state before we moved to Greenville. The water quality is in the top 5 in the country.